Rialto Mayor Deborah Robertson today announced she is joining mayors across the country in asking residents to make a long-term commitment to manage water resources more wisely by taking part in the annual Wyland National Mayor’s Challenge for Water Conservation. Mayor Robertson joins local school children, educators and business leaders to announce participation in the Mayor’s Water Challenge. In return residents can win a new Toyota Prius, water saving fixtures, and hundreds of other prizes. The Rialto pledge is timely because the region’s groundwater basin, which supplies more than half the drinking water for the city, is still depleted as a result of California’s recent severe drought and will need another three years of good rainfall to be fully restored. “Saving water is not only a good practice to do every day, but it’s especially important given the circumstances with our local aquifer. I call on each and every resident to take the pledge to do the right thing to make Rialto the most water-friendly city in the United States,” Mayor Robertson said at today’s news conference. Robertson announced the pledge drive today surrounded by school children, teachers, city commissioners and officials and representatives from the city’s water agencies, local businesses, community groups and civic organizations. The news conference was held at J.P. 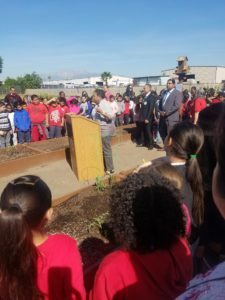 Elementary School, which has won awards for sustainability and whose students are planting and caring for a water-wise garden. Last year, residents from more than 4,100 cities in all 50 U.S. states pledged to reduce their annual consumption of freshwater by 1.9 billion gallons, reduce waste sent to landfills by 42 million pounds, and prevent more than 87,000 pounds of hazardous waste from entering our watersheds. The challenge goes beyond recent drought issues and looks at the ways our water use will affect the future of our communities — from how we grow food to reducing polluted runoff. “Not only do we need people to pledge to save water, we also need them to take action. Rialto Water Services, operated by Veolia, and West Valley Water District offer various rebates to make it easy,” Robertson said. To participate, residents enter online at mywaterpledge.com, and then make a series of online pledges to conserve water on behalf of Rialto. Cities with the highest percentage of residents who take the challenge in their population category are entered into drawings for hundreds of eco-friendly prizes, including home improvement gift cards, home irrigation equipment, and a Grand Prize Toyota Prius. The challenge also features additional resources for residents to take their commitment of conservation even further, from regional water and energy resource issues to cost-saving tips at home. Previous PostCongratulations to GenSTEM Science Fair Winners!